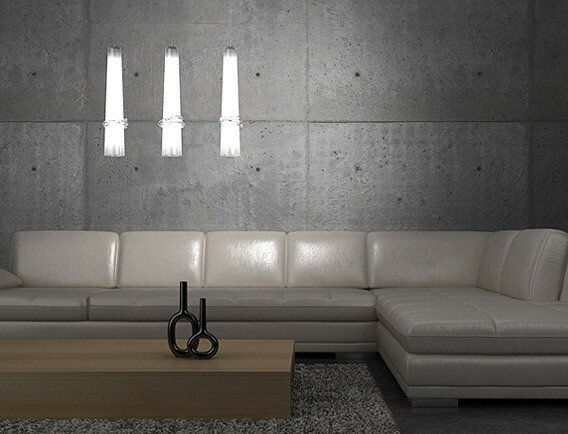 FUENTE lamps are designed with the ones appreciating pure and simple form in mind. These lamps can be used as single light points as well as in different configurations – sets of lampshades positioned in a shape of a circle or row formations are available. Any other configuration for single lampshades is also available upon request. Individually formed, impressive glass decors are added to the slender, hand made lampshades’ surfaces, giving unique, light – reflecting qualities to the lamps. FUENTE line lamps are available in transparent version as well as in two different types of white glass – coloured in mould and painted externally, providing effective, satin surface of the lampshade. The mounting element (at the ceiling) is available in a circle or rectangular shape. Included, high quality and energy-efficient LED lightbulbs provide nice, day light temperature (2700K – 3000K). The power of the lamp is 5,5W (55W incandescent light equivalent) in case of the single light up to 38,5W (385W incandescent light equivalent) in case of a seven light – points unit. Included LED lightbulbs are suited for 230V voltage and aren’t ready to work with dimmer.